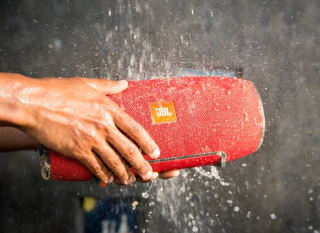 JBL announces Xtreme Bluetooth speaker | What Hi-Fi? JBL’s latest Bluetooth speaker claims to be the most powerful in its class, and features JBL Connect technology and a 15 hour battery life. It can be connected to multiple JBL Connect-enabled speakers, or even up to three smartphones at once. It comes with a rugged, splashproof body, allowing it to be used safely outdoors, and a 10,000mAh rechargeable battery, which can last up to 15 hours. Its USB outputs can charge mobile devices as well. The JBL Xtreme is available from July for £250.